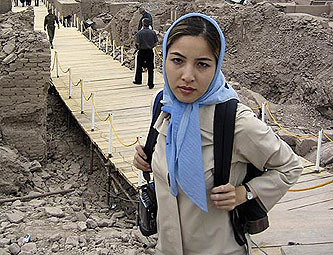 A copy of a classified Iranian government report about the U.S. war in Iraq in the possession of journalist Roxana Saberi was a key piece of evidence that led to her conviction on espionage charges, one of the Iranian American journalist’s lawyers disclosed Monday. But a letter from President Mahmoud Ahmadinejad calling for a careful review of the case helped secure her swift release Monday, another of her lawyers said, in an appellate court ruling that surprised Iran watchers and removed a stumbling block in the effort to improve U.S.-Iranian relations. Iranian intelligence and security officials had argued fiercely for her imprisonment up to the last moment of her lengthy appeals court hearing Sunday, the second attorney said. Iranian politics is opaque enough that it’s probably hopeless to figure out for sure what happened here. Wheels within wheels. Still, Ahmadinejad must have had some reason for intervening. Was it related in some convoluted way to the political jockeying in preparation for next month’s election? It’s hard to see how. Was it meant as a modest olive branch for Barack Obama? Maybe. Was it just because Ahmadinejad likes the spotlight and likes to present himself to the world as a compassionate man? Did it, in fact, have nothing at all to do with Ahmadinejad? More than likely, your guess is as good as anybody’s.